Visitors are spoiled for choice when it comes to museums in Mexico City. In fact it's one of the world cities with the greatest number of museums, and whether you're interested in art, history, culture or archaeology, you'll find something that's sure to be of interest. One outstanding museum with two separate locations is the Museo Soumaya. This private art museum, owned and managed by the Carlos Slim Foundation and filled with the telecommunications mogul's private collection, is best known for its modern, innovative architecture at the Plaza Carso location in the Nuevo Polanco area. The museum is named after Slim's late wife, Soumaya, who passed away in 1999. The museum's collection holds over 66,000 pieces of art. The collection is quite eclectic, with the largest part being made up of European art dating from the 15th to the 20th century. However, the museum also contains Mexican art, religious relics, historical documents and a large assortment of historical Mexican coins and currency. Slim has said that the collection's emphasis on European art is to offer Mexicans who can not afford to travel the opportunity to appreciate the art of Europe. The distinctive architecture of the Soumaya Museum building at Plaza Carso is a major highlight. This six-story building is covered with 16,000 hexagonal aluminum tiles, which is perhaps a modern take on the city's traditional colonial ceramic-tiled building facades, and their reflective quality gives the building a different appearance depending on the weather, time of day and the viewer’s vantage point. The overall shape is amorphous; the architect describes it as a "rotated rhomboid" and some have suggested it alludes to the shape of a woman's neck. Works by Salvador Dalí, Pablo Picasso, Leonardo da Vinci, Pierre-Auguste Renoir, Joan Miró, Vincent van Gogh, Henri Matisse, and Claude Monet. The most expensive piece in the collection is da Vinci’s Madonna dei Fusi (Madonna of the Yarnwinder). 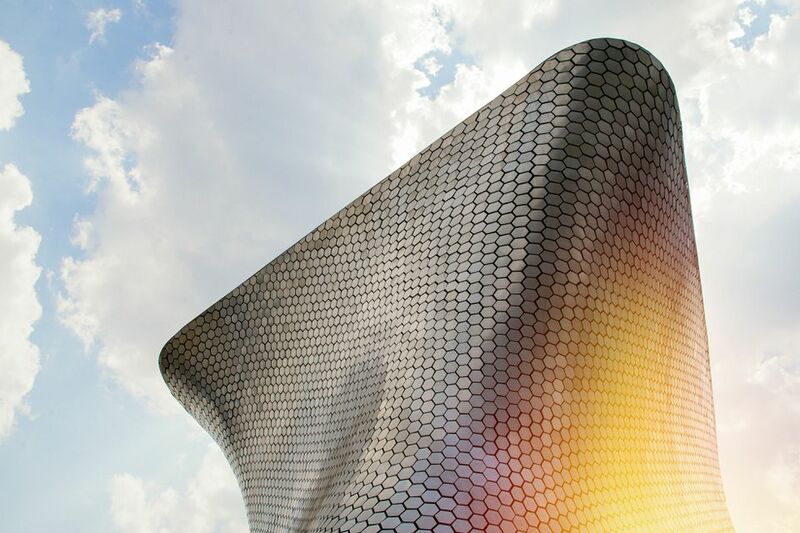 The Soumaya has two locations, one is in the southern area of Mexico City, and the other is more centrally located. Mexican architect Fernando Romero designed the buildings at both locations, and though the Plaza Carso location is more recognizable, they can both be considered outstanding examples of modern Mexico City architecture. Plaza Loreto Location: The original location is in the San Angel area of Mexico City, at Plaza Loreto. It opened in 1994 and is built in an area that was Spanish conquistador Hernán Córtes’ encomienda in the south of the city during the colonial period, and is now made up of a district of modern office towers and public plazas. Getting There: Nearby metro stations include Miguel Ángel de Quevedo (Line 3), Copilco (Linea 3), Barranca del Muerto (Line 7), or on the Metrobus: Doctor Gálvez. Getting There: Nearby metro stations include Río San Joaquín (Line 7), Polanco (Line 7) or San Cosme (Line 2). Services: Besides the exhibition areas, the museum also houses a 350-seat auditorium, a library, offices, a restaurant, gift shop, and a multi-purpose lounge. When visiting the Plaza Carso location, take the elevator to the top floor, an exhibition space filled with natural light, and take your time walking down the ramps, enjoying the art all the way to the bottom. After visiting the Soumaya museum, head just across the street where you'll find the Museo Jumex, which is another of the city's excellent privately-owned museums. 10:30 am to 6:30 pm daily. Plaza Loreto location is closed on Tuesdays. Entrance to the museum is always free for all.